SolusVM Control Panel, a Powerful UI Based VPS Management Software. 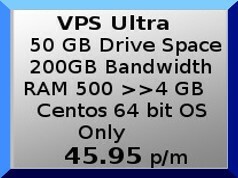 All our VPS OpenVZ virtual machines are same day installed and are easily upgradeable on the fly within minutes of your request being received by one of our experienced technical staff. Get the freedom you need from your VPS. With full Root or Administrator access you can customise your Virtual Private Server to your own specifications and experience the flexibility of a dedicated server without needing to spend a fortune!